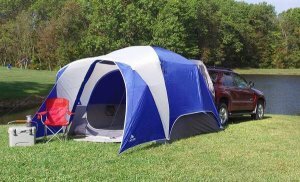 SUV and minivan tents are a very simple attachment that we can utilize to improve our camping experience. 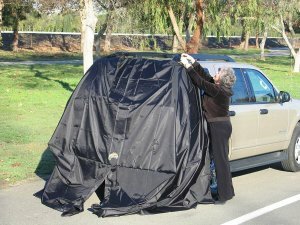 Seamlessly attaching to the rear of the vehicle, creating a sheltered area for shade, storage and sleeping. With spacious interiors fitting up to 6 people on some models, they are also fully waterproof given the use of polyester and polyethylene in the fabric. Creating a perfect accessory that will make your trip far less hassle. 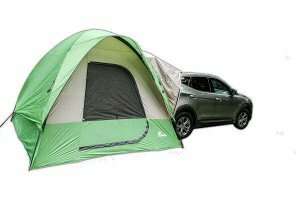 With the growing popularity of vehicle camping, mainly due to the success of roof top tents and truck bed tents, SUV tents were established to offer a similar experience to minivan and sports utility vehicle owners. There are many advantages to using one in comparison, being at a ground level you can enjoy larger dimensions, providing space for all the family. Also awnings and canopies are a common feature, giving even more shade and shelter to the group. You can rest easy knowing you are not putting excessive weight on axles and suspension. 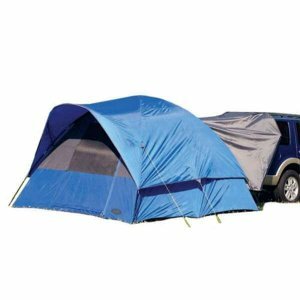 What is an SUV Tent? How does an SUV tent work? How much is an SUV tent? Why use an SUV Tent? As usual we are met with the common problem of a successful product, the usual names and a few new faces, is the mass production of varying types and models. It’s difficult to know which one is right for your group and more importantly, compatible with your vehicle. We have reviewed the best performing models on the market, scoped the features and compared them side by side, let’s find out which ones came out on top. A variety of sizes and models available, provide versatility with vehicles. We like the plus model due to its unmatched room space and the optionable side screen room or front screen room, there is a choice. A very tall head height of 7.5 foot, combined with the 9.5 x 9.5 feet rooms, creates a spacious cabin feel inside. The screened rooms are 9 x 6.5 feet for both the side and front options and the whole tent has a HDPE floor which is removable. For this model you can use the trunk for storage as the tent is so big, which helps with family camping to keep the clutter down. One of our favorite features is the ability to create a canopy on the front or side, using the door awnings. 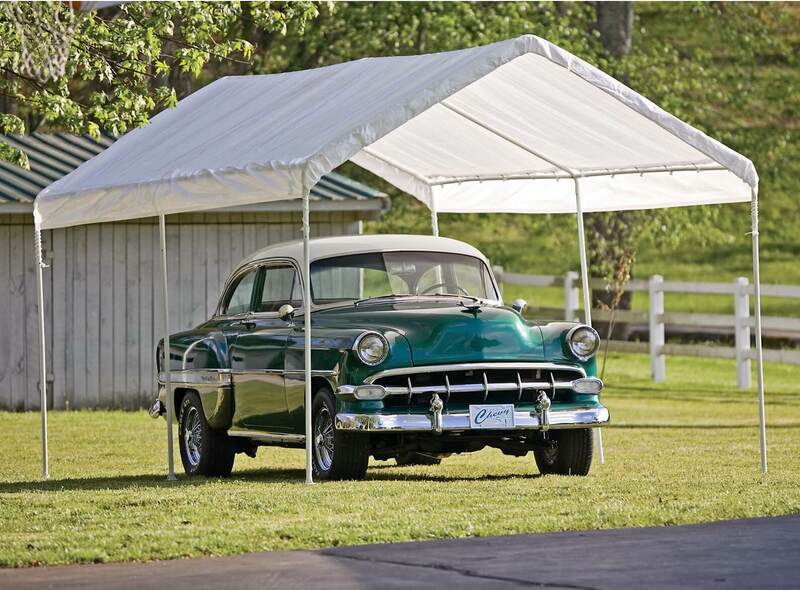 This creates a huge 15 x 9 feet canopy that provides significant shelter and shade during hot days, additionally a perfect spot for the picnic table. Additionally it is fire retardant, so enjoying a grill or bbq nearby is fine without concern. Solid materials used in the manufacture, 190T Polyester for the rainfly and tent fabric, which has a 3000mm PU coating, providing superb water protection.Consisting of steel and fiberglass in the framework to maintain a light but strong structure, including 32 pegs and 10 cords, it’s not the easiest to set up and will require some patience on the first attempt. Ventilated with breathable polyester and with the 3 doors and meshed windows, keeping fresh air circulating inside ill not be a problem. Price wise one of the highest in our list, but with a 3000mm rating, screened room, awning canopy, HDPE flooring and many others, it’s worth it. The top selling Outdoors Sportz range has a host of features and are top quality. Ranging from 3 man up to 5 man models. As you can see from the picture, the 5 person model is huge and can easily sleep up to 5/6 people, catering for the whole family. The sock attaches to the rear of the SUV, adapting the cargo area into a sleeping area. You could also set up sleeping beds and pads inside the tent itself, given that it has spacious 10 x 10 rooms. There is a footprint, but unfortunately it’s sold separately. The frame has been fortified with steel on the weak points, strengthening the tent overall. Easily set up, it can be done by 1 person by following the simple instructions. Two of the best features is the screened room, which offers an extra 7 x 6 feet of shade and shelter. Secondly the side awning that provides a perfect place to set up the picnic table when its dinner time. Fully waterproofed material in the form of Polyester Taffeta and the floor is a durable Polyethylene, which is commonly seen on canopies. A premium model that can rival Napier and Kingcamp for the best family oriented SUV and minivan tent. With a modern design, simple strap attachment system and spacious interior, it’s become one of the top selling tents in this niche. This is compatible with any vehicle that has rear hatch/barn doors, so it can be used in a wider range of vehicles. The set-up is simple and follows a few steps, utilizing straps to attach under the wheels and above, if you have a roof rack. It can attach with or without, so versatility is there. The features are plentiful and keep up with the competition, such as the PE floor and large storage pockets. A few helpful extras are the lantern hook for attaching a camping lantern and also the glow zippers, making things more convenient in darkness. All of this comes complete with free rainfly and rain proof storage bag. This type of model is very useful for camping with children, it allows a separate sleeping area that is in close vicinity. Another model from Napier is the Backroadz, slightly smaller than the Sportz, however a reliable, economical and versatile tent nonetheless. Like most of the tents from Napier, they are extremely versatile, attaching to nearly all minivans, CUV’s and SUV’s alike. The head height is still tall on this model, standing at 7 feet, so you shouldn’t have too much trouble walking in and out. Designed as a dome shaped tent, similar to the Coleman pop up, its tall for a dome as they normally have lesser height compared to cabin designs. A footprint area of 9 x 9 feet it is pretty spacious, boasting sleeping space of up to 5 adults. I would however suggest this for 3-4 max, it’s not as big as the Melfi or Sportz and they are 5 man. 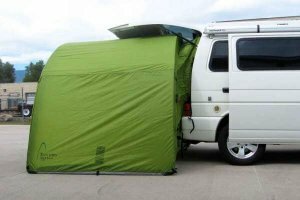 Connects easily to the cargo area of the vehicle and is ventilated by the large doors and 3 meshed windows. Storm flaps are integrated onto the tent, providing additional areas to secure the tent down. Capable of standing alone, you can still make use of the vehicle after pitch, due to a patented sleeve that is easily attached and detached. Price wise, everything you can expect from Ozark, but with a decent enough quality, it makes our list. This 5 person tent fits both SUV’s and Minivans alike and is perfect for family camping or large groups. Spacious rooms, tall head-height and can provide ample sleeping space for your bags and pads. Free standing, so you can leave the tent set up alone when you want to hit the trail backpacking. Additionally there is a detachable rain cover, which can be removed on hot days to aid air circulation. Featuring various storage, like the ‘media’ pocket inside the shelter and also multiple other pockets and pouches to store your bits and pieces. The mud hat attachment provides some cleanliness internally and a vestibule is fitted that works against wind and rainfall. Given the price, it’s not going to last under serious conditions. However, it is a good choice for first timers, the odd family trip, and a cheap and cheerful option. A lesser known brand and model, but with truly amazing specifications. A diamond in the rough and we are happy to present the 6S in today’s review. Albeit not the most aesthetic color theme, but easy to spot on the campsite. The interior is roomy, with 10 x 6 x 6.6 feet dimensions, plenty of room for storage, tables and chairs etc. It additionally has an enclosure facility, offering full protection in the case of adverse weather conditions, this works by way of attachable zippered doors. Universal in attachment, it can be used with most SUV and minivans, but with this price, I would message the manufacturer just to be sure prior. The feature we were impressed with most is the level of protection, equal to some of the high quality ground tents, it has a 2000mm coated polyester fabric. This can withstand even heavy rain out on the field, allowing you to venture out without too much concern. 185 Nylon RipStop is long lasting and durable, raising the price, but adding longevity to its usage. All stored away in its free canvas carry bag, weighing up to around 24lbs in total, a strong competitor to consider. A decent model popularly sold on Amazon and Walmart, which is compatible with most SUV’s and minivans. On paper a premium model, however its execution isn’t as good as some of the other models. It can’t be denied some of the features are excellent. Spacious 10 x 10 rooms with 76 inch head height, can easily sleep up to 4 people. It can standalone and has well-made materials. The floor is RipStop Polyethylene, while the tents material consist of 190T Polyester with a 1000mm Polyurethane coating. The walls have had an 800mm coating, we would like to see this reaching 1500-2000 to properly prevent water penetration, this would hold up in light-moderate rain only. Storage pockets are included in the form of 3 wall pockets, which are deep. The tent is flame proof and is CPAI-84 certified, safety during family grills and barbecues. Storm flaps are additionally included with 16 steel anchors, securing this model in strong wind isn’t a problem. All in all it’s a good SUV tent, fire retardant, secure and spacious. The waterproof rating lets it down, but will fare well in light weather. Low waterproof rating means it won’t fully protect you in anything above light rainfall. Designed for use with vehicles that have a lift gate rear panel with dimensions less than 67 inches wide. Additionally with no tire fitted externally on the back. If your SUV or minivan match this criteria, then the Explorer 2 from DAC will be a good fit. A simple set up, utilizing bungee cords which attach to the tire wells. A slightly different method to other models and perhaps not the tightest fit, but works well for the price. Probably one of its shining qualities is the price, it’s on the low end and matches Ozark economically. Ranging around $120-$150 depending on the provider, its on the lower end of the spectrum for minivan tents. Some of the features include door panels which are foldable, allowing for easier access and ventilation. There is also a screen which includes a fine mesh, to repel bugs, it also offers some level of privacy. 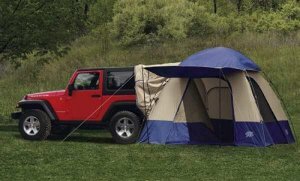 If you’re unsure if this tent is suitable, they have a large list of compatible vehicles on the product page. A slightly different design and use to the other models. 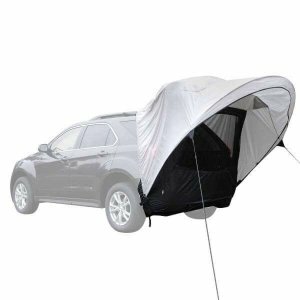 This sleek, compact hatch tent can be used as a privacy shelter when sleeping inside the vehicle. It’s manufactured as a surfing accessory, perfect for when you’re hitting the beach and need a quick change into your wetsuit. Made primarily of nylon it has moderate strength, however the material is quite thin so for full privacy, you may need an extra sheet of fabric. It’s extremely lightweight at 3.7 lbs. and doesn’t take up much space at 18.5 x 16 when packed down. Attaches in a simple way by way of straps, which latch onto the rear entry point. It also utilizes magnets to secure on the sides and buckles for the roof-rack. All in all a very simple set up and a cheap and cheerful option with limited use, but it could be perfect if that’s all you will use it for. The Esbjerg from Skandika is our most uniquely designed model in the list. 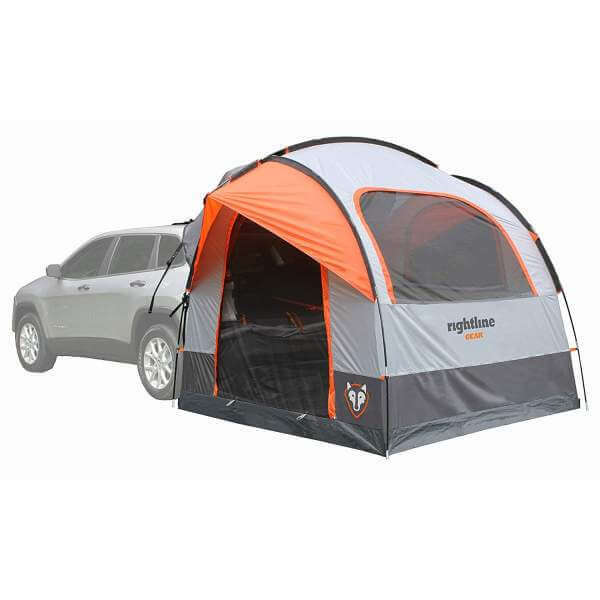 Not only the design, but its huge, the largest tent available to attach to your SUV or minivan. In a elongated tunnel design with various different compartments and rooms for sleeping, it’s a unique model. The additional feature, that is very important for this size, is the free standing ability. Allowing you to utilize the car while out on those family camping trips, because this is definitely designed for large groups. A sewn in groundsheet keeps the ground clean, the fiberglass framework keeps the tents weight down, making it easier to carry and the set up isn’t too challenging. Waterproof with a free rainfly to boot, a unique and interesting model for the larger group camping trips. Fiberglass isn’t as durable in strong winds, position well, using the car to block wind direction. Low in stock, being a relatively unknown company compared to Napier, Ozark etc. A smaller, economical choice in comparison to its larger sportz counterparts. Perfect for a quick getaway in a small group, which requires a lightweight, easily stored and equally simple set up method. 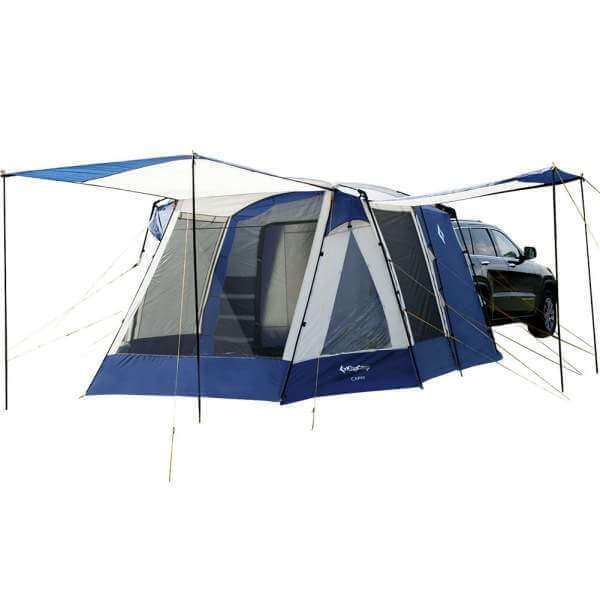 Additionally comes with a 2 foot long awning attachment, providing a decent area of shade, great for a few camping chairs. Featuring a universal attachment system, making it suitable for the majority of SUV’s and minivans on the market, old and new. The screened mesh works to repel insects and bugs, secondly providing a small form of ventilation inside. Manufactured with polyester taffeta, it meets the industry standard in materials and they have also included some storm flaps. You can use these to add additional anchors on the sides, securing in strong winds. However, be careful when its dark, they are completely invisible, try to attach some reflective strips to avoid tripping. An OEM piece from Mopar but specifically for Jeep Liberties in the 2003-2011 range. Attaches to the back and comprises of a 10 x 10 square foot tent, in blue and gray color theme. The tent has 2 doors, providing good circulation internally and also a clear entry and exit point. Additionally protected from bugs and mosquitos by the meshed windows. Fits like a glove on to the lift gate and can be set up on the ground easily with the tent pole system. At the higher end of the pricing market, however it does come with a lot of free accessories. Like the rainfly and an overhead netting which can be used to store gear. It also has the ability to stand alone, in case someone needs to borrow the jeep for the day and you’re left alone. A smooth, compact dome tent that slots onto the rear of your vehicle like a sock. A mid-range SUV tent that can sleep up to 4 people, or 3 plus storage. The dimensions are 8.5 x 8.5 and has the ability to standalone without the vehicles support. There are 2 doors on this model as opposed to the Backroadz 1 door, but equally has 3 meshed windows. The mesh is ‘no see um’ so it provides a better level of privacy. Additionally it has an awning attachment, creating a 6 x 6 shaded area on the side of the tent. It also has storage pockets internally and a gear loft to store larger possessions. The set-up is simple and can be done alone, mainly due to the shock cord fiberglass poles that are insanely light to maneuver during the pitch. A smaller tent than the Backroadz, but admittedly it has a lot more features with the storage, awning and extra door. An OEM model designed for use with Honda vehicles. It is a top quality tent and has some great features. Purposely built for the CR-V, Odyssey and Pilot models, it’s usually a good idea to go with OEM where possible, to stop things like slanted roofs running water into the universal tents. A respectable waterproof rating of 1200mm, due to the polyester used in manufacture. A rainfly has been added that extends into an awning and provides an additional 36 square feet of shade. Great for multiple scenarios like tailgating or barbecues under the awning, the durable RipStop polyethylene floor will hold up well under lots of feet. Importantly it also works as a standalone tent if the vehicle needs to be used or you wish to move to an area the car cannot. OEM products tend to be a little more expensive than the universal models, this is pretty standard when we pay for a custom built product. Essentially a ground tent that attaches onto the rear of your vehicle, providing an extension space to camp and sleep in. They have a funnel like attachment that slots onto the backend, allowing you to sleep in the cargo area or in the tent, depending on the design. It provides a new experience while camping, allowing you to utilize the space and protection of your vehicle during your camp. Generally attached by Bungee cords or Velcro straps around wheel arches and roof racks. They are also compatible without roof racks, in these cases some models often use magnets to attach on the side. Like a ground tent you will stake it to the ground and use guy-lines where necessary, most models have additional storm flaps to further increase security. Most models can detach from the vehicle and ‘standalone’, allowing use of the vehicle when needed without jeopardizing your shelter. Ranging from as low as $80 for a small, changing room style model that will slip on with bungee cords and be quite loose fitting. To $350 tents that can sleep up to 5 people, have 6 x 6 awnings and screened rooms, fully waterproof and plenty of storage. An OEM piece can reach up to $400 as they are specifically designed for certain models of SUV’s like Honda and Ford for example. If you have an SUV at least you have the option of attaching it to your vehicle, with a ground tent it’s never possible. So, you have the best of both worlds. If positioned correctly the vehicle can protect you from strong winds and rain. You don’t need to unload everything from the vehicle when you set up, you have extra storage space. It’s efficient capacity wise, as you can sleep some in the cargo or rear area, freeing up more space inside the tent for tables/chairs etc. 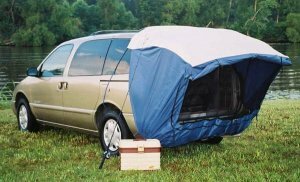 Simply put if you are an SUV owner it’s almost always better to buy one of these, compared to a traditional ground tent. You might be confused as to why they are even a good idea. Let’s discuss some of the advantages. 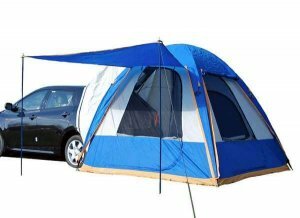 In conclusion SUV or minivan tents are a great idea IF you are the proud owner of one of these vehicles. They provide a slightly different camping experience that definitely has its advantages in comparison to a traditional camping tent. Allowing the vehicle and tent to work together, providing further convenience and benefit. We will continue to update the list where necessary in the future, but as of 2019 you won’t find better than these models on the market. We hope you enjoyed and please drop a comment or share if you found it helpful. Hey Jill! Glad that you found this useful.